I mentioned in an earlier post that I allowed my daughter, visiting from the US, to choose which small museums we would visit together on our day in Amsterdam. 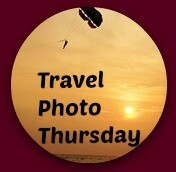 She chose the Huis Marseille Museum for Photography and the Brilmuseum (Spectacles Museum). Disclosure: While admission normally costs €4.50, I was admitted for free, but the opinions expressed above are my own. NOTE: Since I published this article, the Brilmuseum has, unfortunately, closed down. The exterior of the eyeglasses museum in Amsterdam. I did not have high hopes for either one, and I particularly feared that a museum devoted to eyeglasses would be about as interesting as a museum devoted to handbags. Nevertheless, I couldn’t very well say no, and now I’m glad I didn’t. Note to self: trust my daughter’s judgment. The best way to describe the Brilmuseum is “whimsical” and, against all expectation, I enjoyed it. 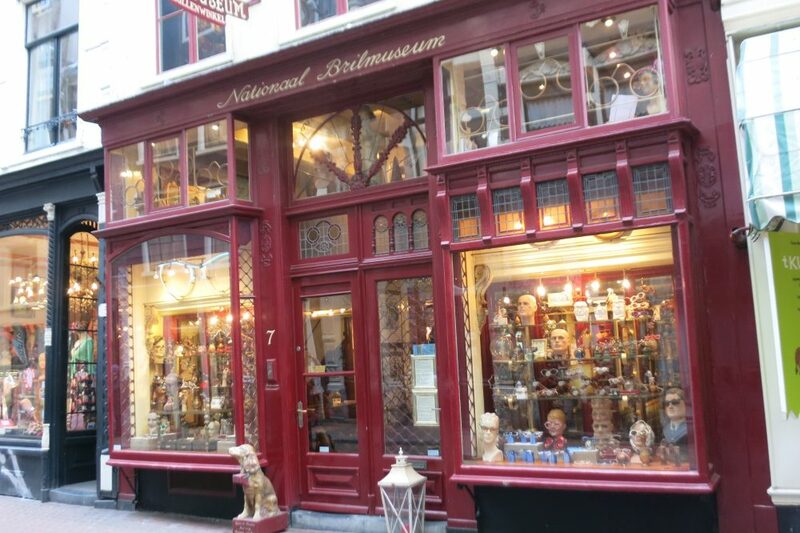 From the outside, this is one of those “old-timey” storefronts you find sometimes in Dutch towns, filled with an array of antique eyeglasses. Entering, it’s not immediately clear that this is a museum; it could just as well be a shop filled with second-hand glasses. The rather abrupt woman at the counter explained that downstairs is indeed a shop, while the Brilmuseum itself is upstairs on the second and third floors (third and fourth floors, in American-speak). 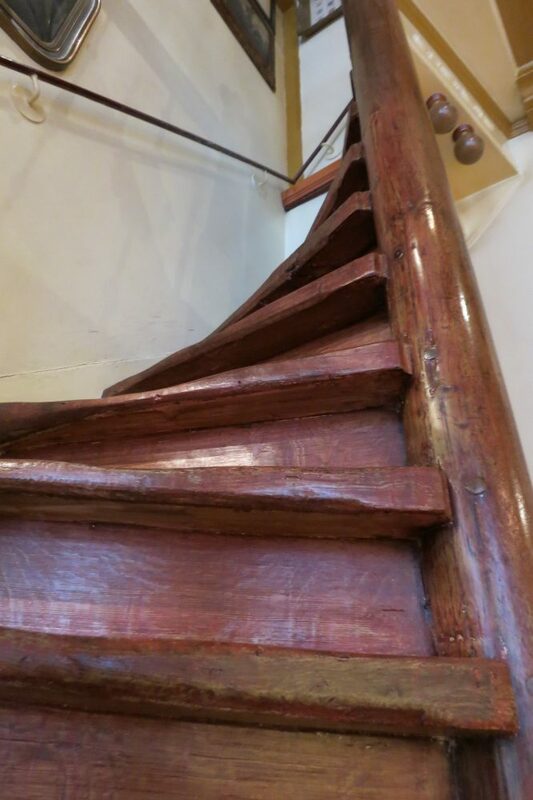 While the woman wasn’t particularly welcoming, the stairs were: these were seriously steep, worn-down stairs, seemingly centuries old. Climbing them felt a bit precarious, but made exploring seem an adventure. By the time I got to the second floor, I was already sold: never mind the eyeglasses; this building was special! Heavy wood beams set low overhead. Interesting painted ornamentation on walls and ceiling. The floor even tilts, making me feel a bit off-balance: presumably the whole building leans, as many of the Golden Age buildings in Amsterdam do. 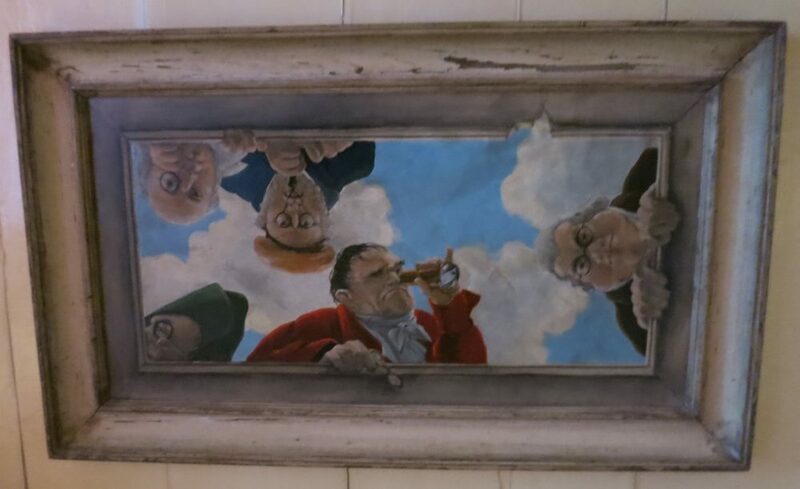 A whimsical painting on the ceiling of the top floor of the Brilmuseum. The collection of glasses is remarkably well-displayed, considering the limitations of the space and lighting. In some places glare on the display cases was a problem, but the way the objects were arranged and labeled made it surprisingly interesting. The oldest ones in the collection—wood frames, simply held on the person’s nose with a finger—date from the 1300’s. Sidepieces on glasses apparently didn’t appear until the 18th century in Paris and London, and even then they didn’t hook onto the ears. Instead, the sides ended in a ring, which pressed the glasses onto the wearer’s head, or else were held in place by the wearer’s wig. 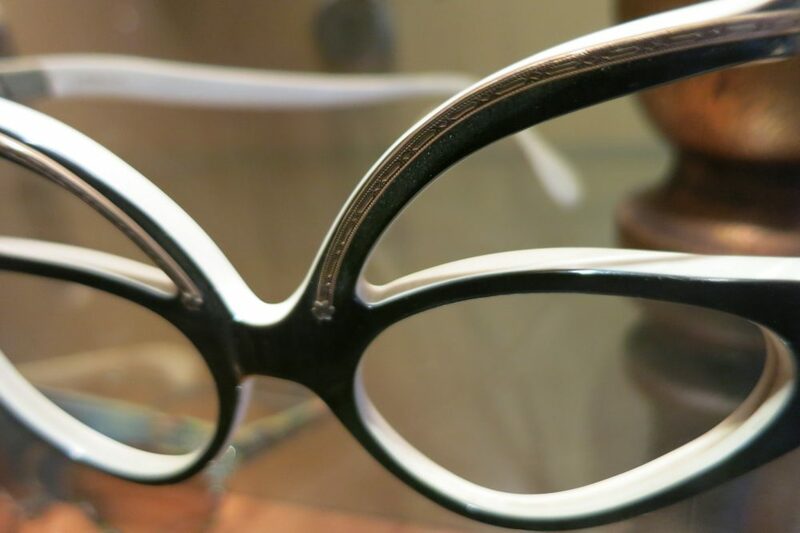 Railway spectacles from the 1800’s; pince-nez; monocles; opera glasses; early, huge contact lenses; plastic, tortoise-shell, metal, or wood frames ranging from the middle ages to the 20th century: they’re all here. As are a range of related items like vintage advertising for glasses, tools of the glass-making trades, etc. Above, on the walls and wooden beams, vision-related sayings have been painted, mostly in Dutch, some in French. The exhibit covers only two relatively small rooms on two floors, but we spent about 45 minutes to see it well. If you’re in the area (a couple of blocks from Dam Square, on Gasthuismolensteeg between Herengracht and Singel), it’s worth a stop. Also, if you’re in the market for vintage frames, the store (set in the two former storefronts on the ground floor) might be worth exploring, as well as their webshop. Rachel, I must admit: you come up with the most unusual things to post about – I love this one! I certainly find it fascinating to learn about the history of day-to-day things we all use. I’m glad you enjoy my obscure museum visits! Berlin is definitely on my list: might be my May Vacation destination! I give you a lot of credit for being so open. I would have reacted the same way initially, but good for you for seeing the whimsical and fun in this museum.I have yet to visit the “Shoe Museum” in Toronto and yet I’ve heard it’s quite good. Guess we need to listen to those younger than us more often. I don’t have the attention span for large museums, so small, quirky ones are perfect. And my daughter is always good company! A shoe museum could be great fun, or it could be a yawn, but you really should check it out to see! This is fascinating! And great timing too as I am off to Amsterdam next week so, along with your other posts, I shall be seeking this place out! And the woman: was she particularly abrupt, or just Northern European ‘efficient’ / cold? A bit more than the usual abrupt perhaps, but it might have been just a bad moment. Anyway, if you go there, tell her you found out about it from this post! I thought that we had covered Amsterdam pretty well in the three times we have visited, but Wow! You found so many coll little museums. Lovce your series about small museums in Amsterdam. Glad you’re enjoying it! More to come next time I go to Amsterdam! 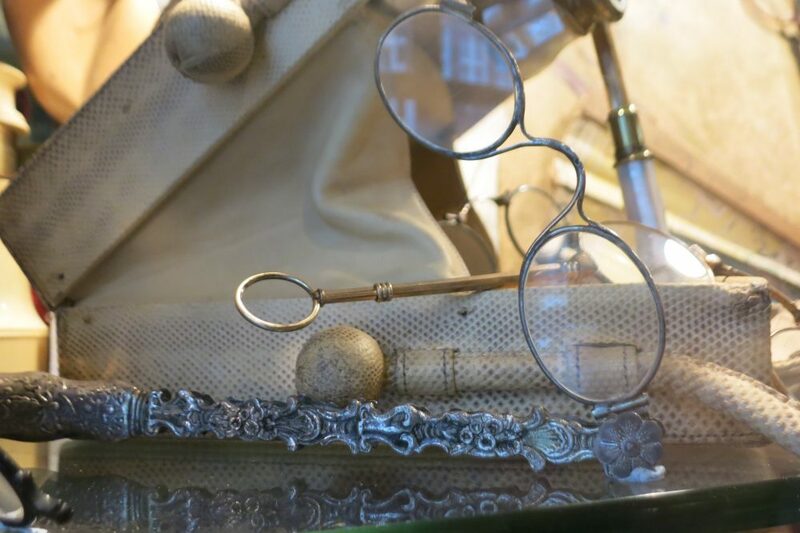 Who would have thought there was an eyeglass museum to explore there? Loved this post and that sense of adventure and discovery that has been a common theme since you started your museum treks with your daughter! Love this. I so appreciate the smaller, quirky museums and collections like this when I’m traveling. Wish my travel buddies did as much too. I am always happen when the building is interesting. It doesn’t matter the contents when that is the case. An Amsterdam museum of bags and purses! Body Worlds: Museum or Freak Show? Yes, you CAN visit the Rijksmuseum in two hours!